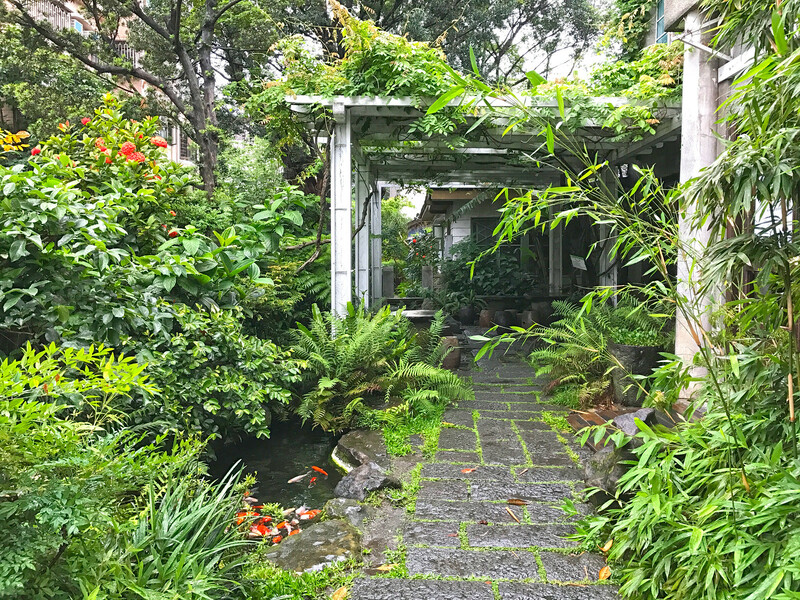 Maokong is techically part of Taipei but it feels like another world. 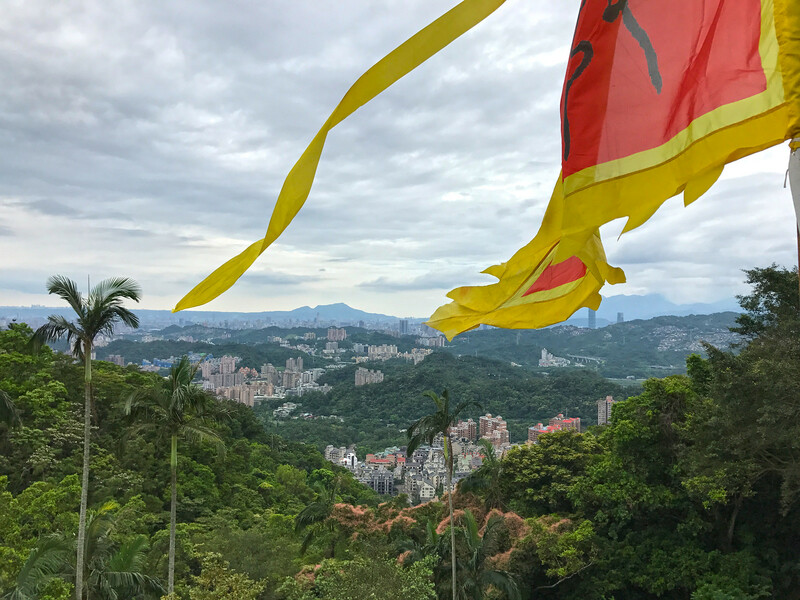 The area used to be the biggest region for growing tea around Taipei and today that tea culture is evident, and Maokong is filled with teahouses, hiking paths, and temples along the way. 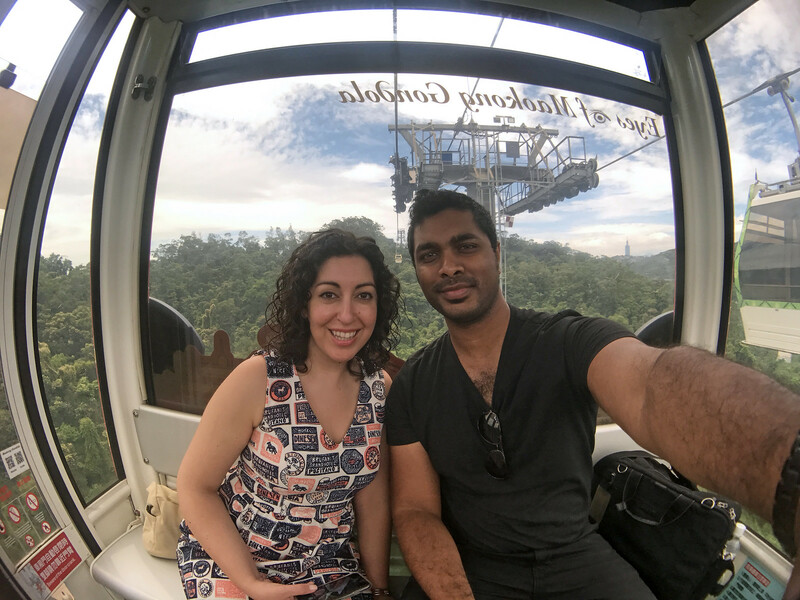 We took a four-kilometer gondola from Taipei Zoo station all the way up to Maokong station. Once we were in Maokong, we meandered through the picturesque hiking trails, stopping for a snack here and there. 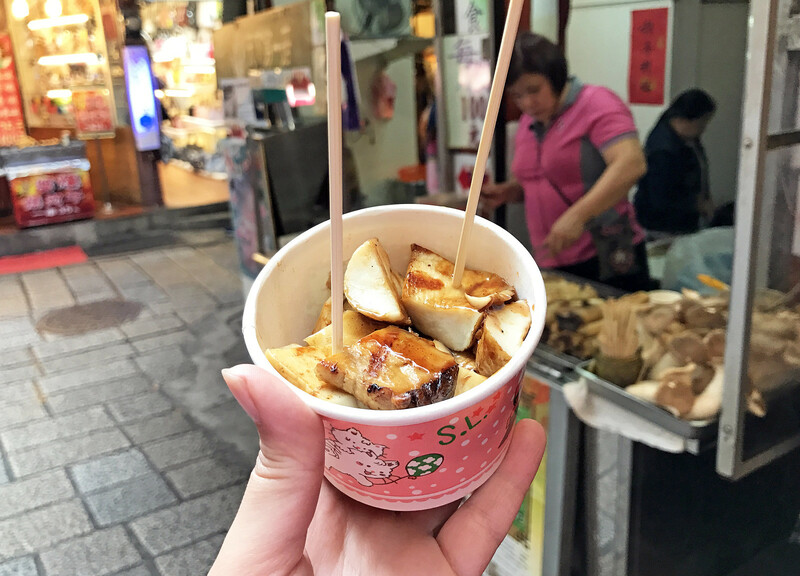 Douhua (sweet and soft tofu pudding) with crushed ice, grilled baby corn, fried sweet potatoes, and squid balls from street vendors kept us happily satiated along the way. 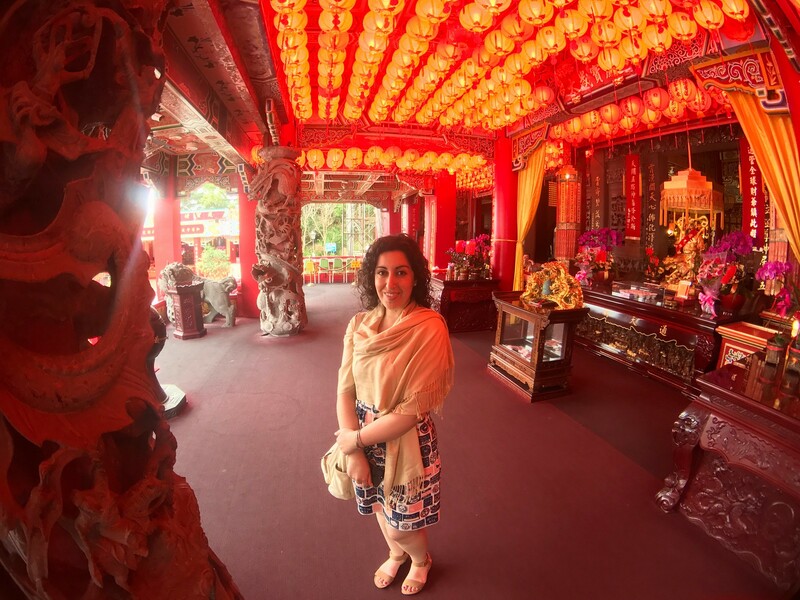 On our way back down towards Taipei central, we stopped at Zhinan Temple, a Taoist temple on the slopes of Houshan. 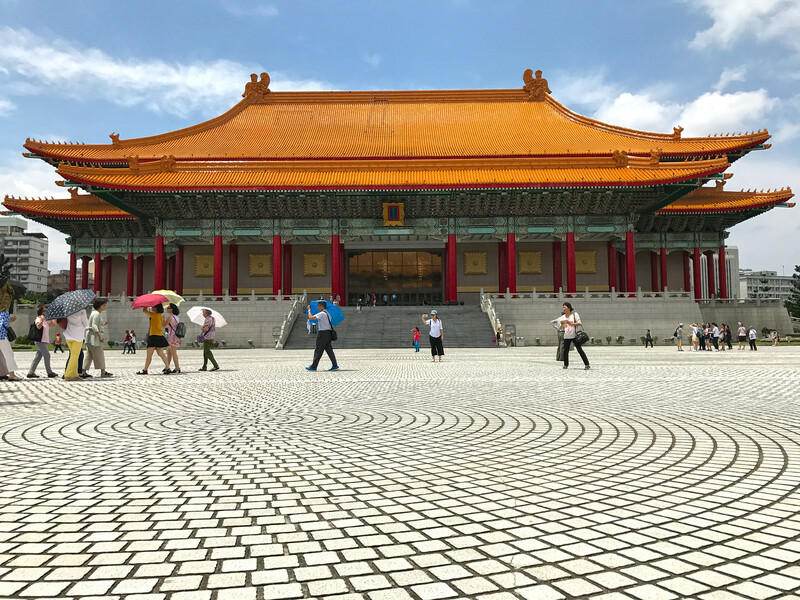 Founded in 1882, the temple afforded incredible views into Taipei. 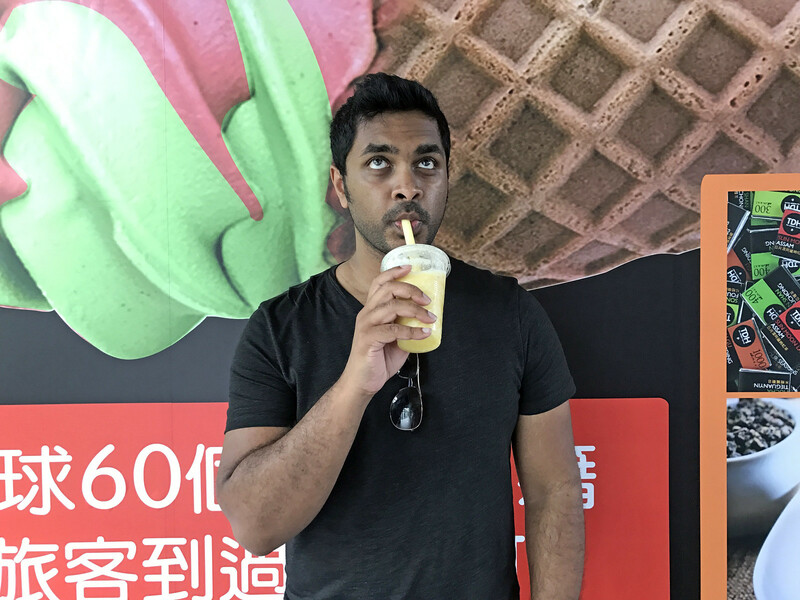 By the time we got back to Taipei Zoo station, we couldn’t resist the siren song of a freshly-made pineapple smoothie to beat the stifling heat. 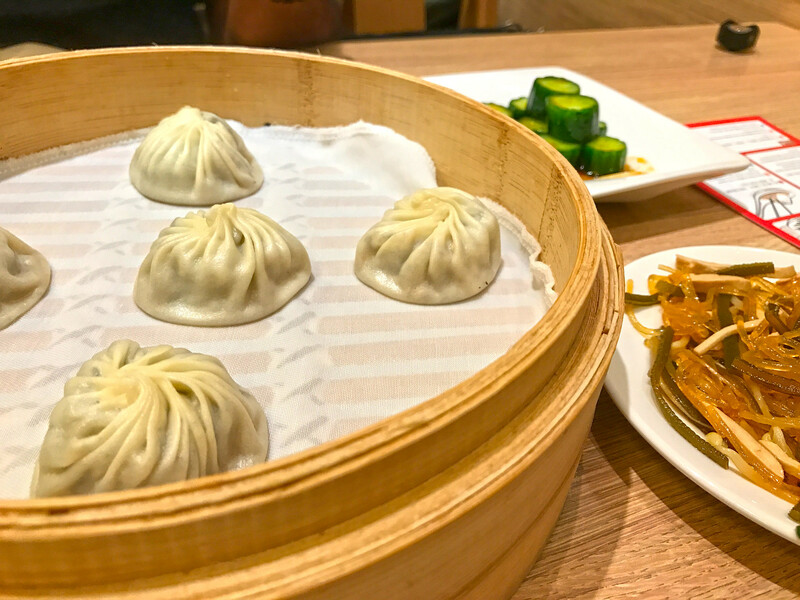 For our last dinner in Taipei, we enjoyed a delicious meal at Li Yuan Dumplings: xiaolongbao, salt and pepper tofu, stir-fried chili chicken and mushrooms, and greens in dashi and citrus dressing. A fitting end to a delicious, memorable trip. 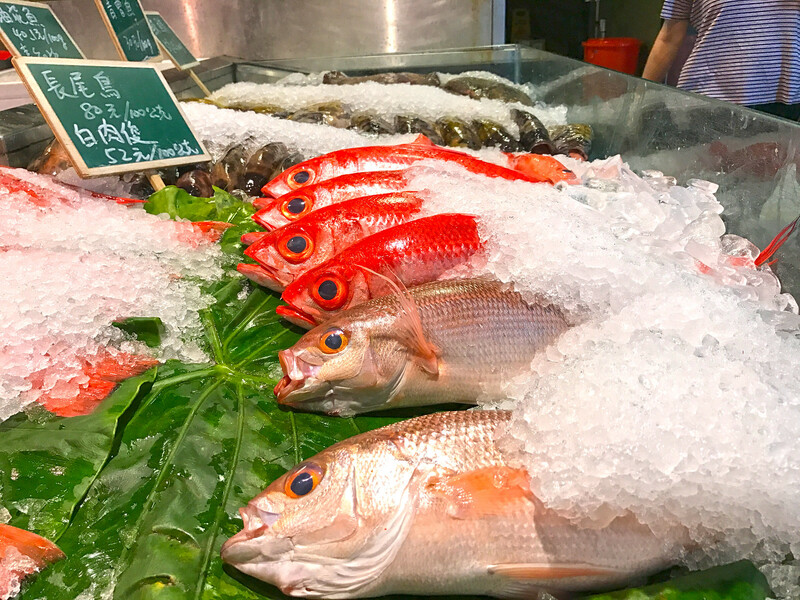 What do you do when you’re in Taipei and craving fresh fish? 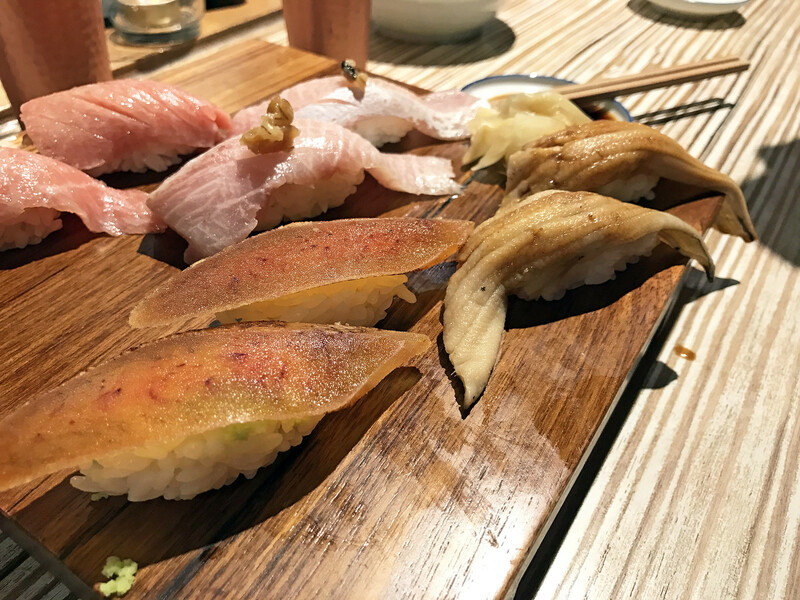 Eat sushi! That’s right. 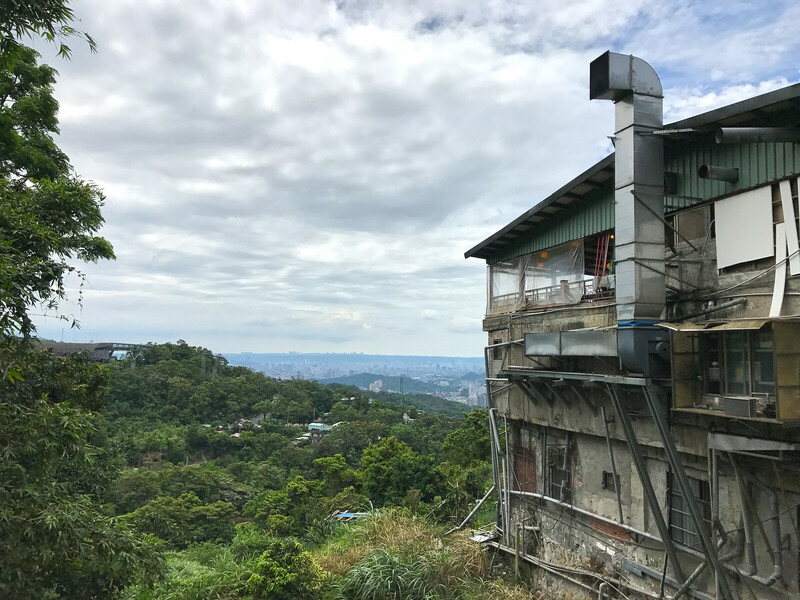 Taiwan is a former colony of Japan, and it’s got a bit of a complicated love affair going on with its former colonizer: Japanese influence abounds throughout the island and local sushi, ramen, and onigiri are ubiquitous (and of excellent quality). But first, a quick note about breakfast. We stayed at the Les Suites Hotel, a centrally located boutique hotel just a few steps away from the Nanjing Fuxing MRT station. 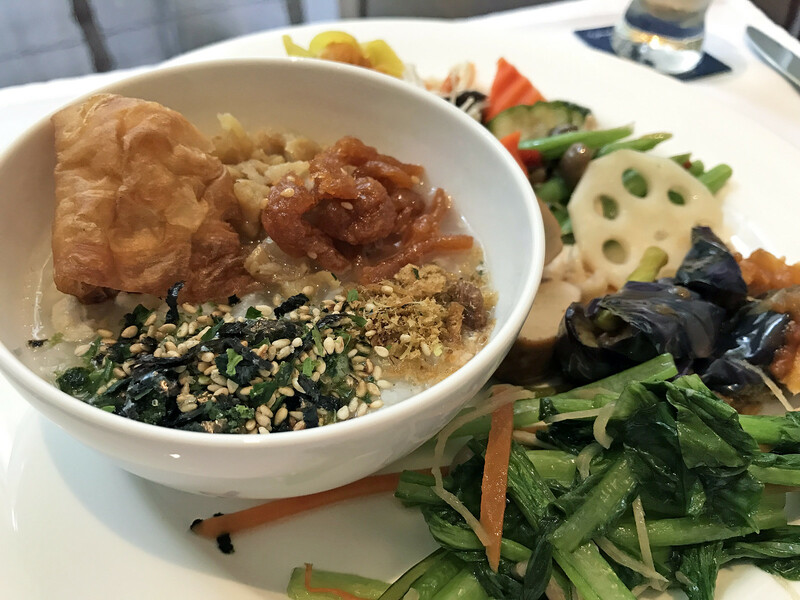 The service was warm and the highlight was the daily breakfast: a cornucopia of congee, preserved eggs, dumplings, fresh vegetables, and all manner of pickled things. Now that’s my kind of breakfast. But back to the sushi. 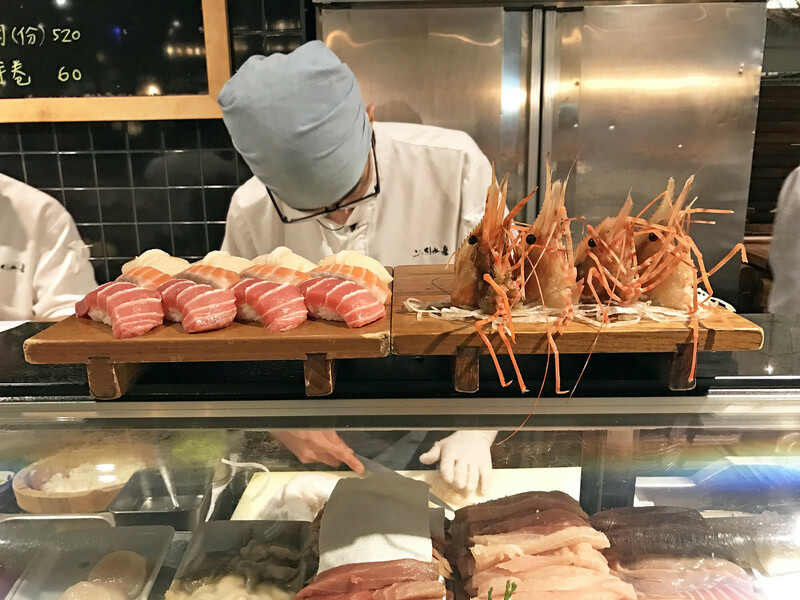 Addiction Aquatic Development is a modern seafood market meets sushi bar meets seafood restaurant meets hot pot meets…well, you get the picture. 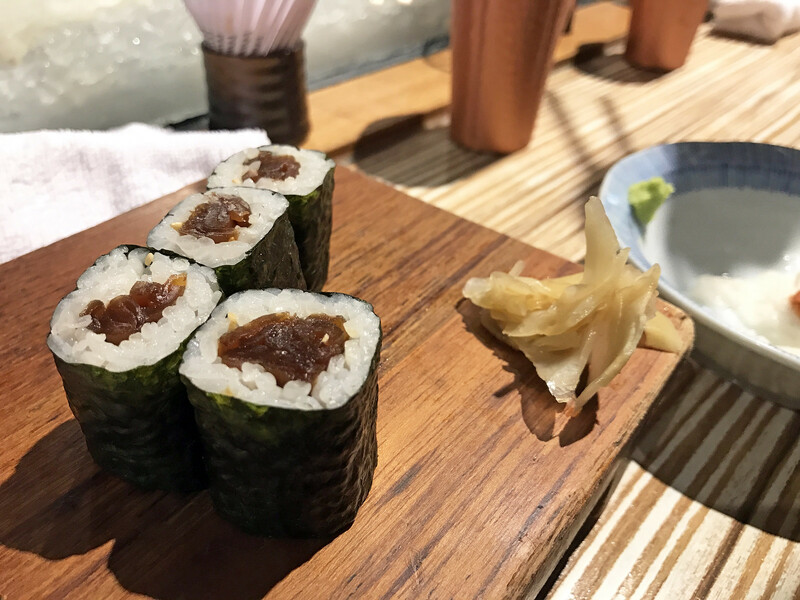 There are fruits and flowers and all kinds of other pretty things on sale, but the main attraction is the sushi. 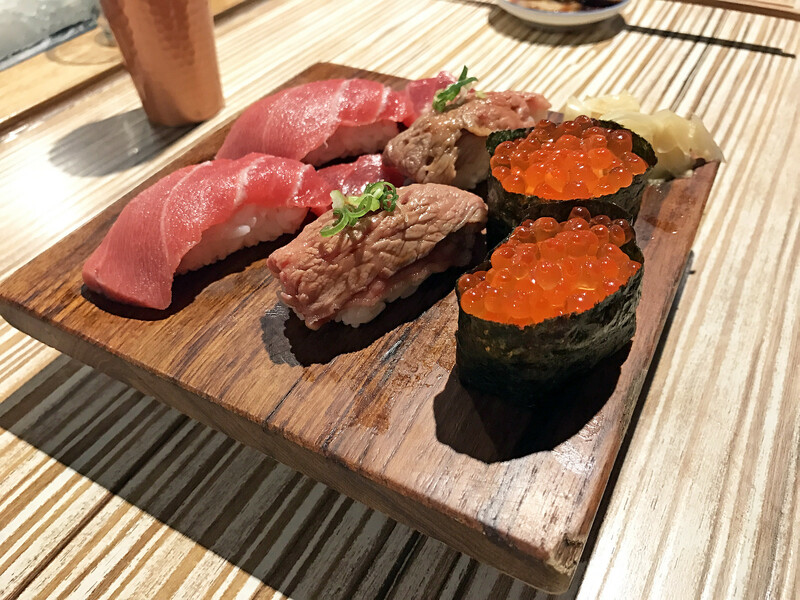 We started with an appetizer of uni with Japanese yam before moving on to kampyo, otoro, cured roe, tuna, steak, and salmon roe sushi. 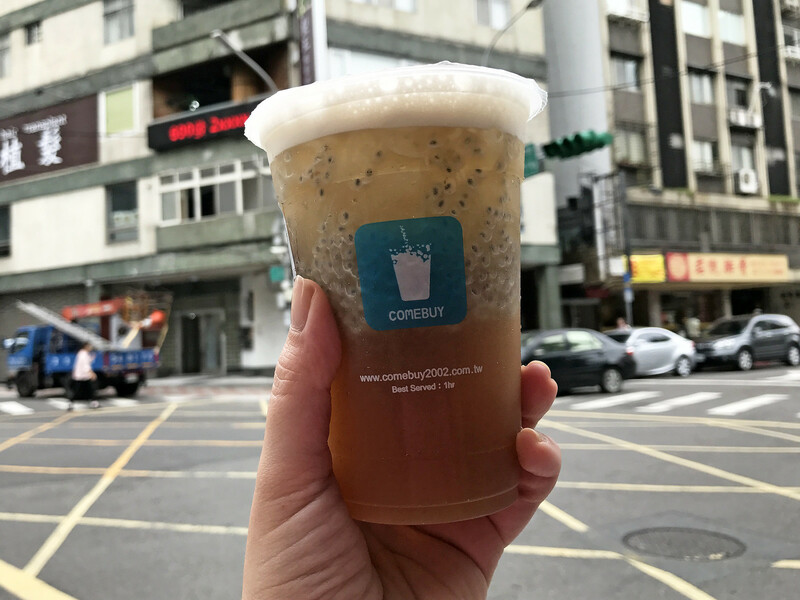 All that sushi called for a plum tea with basil seeds at Comebuy. Hey, basil seeds are good for digestion so ¯\_(ツ)_/¯. We spent the rest of the afternoon exploring MAJI Square, a design-centric marketplace housing local artisans, creative vendors, and an array fo food stalls. 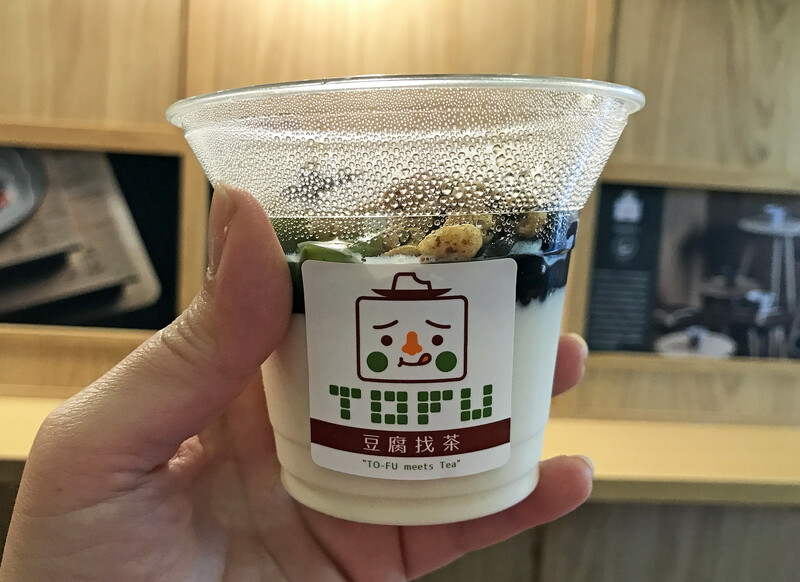 We snacked on a pleasantly sweet and super QQ snack of cold tofu with taro and grass jelly at TOFU Meets Tea before taking the MRT to Ximending for an evening stroll in the rain. 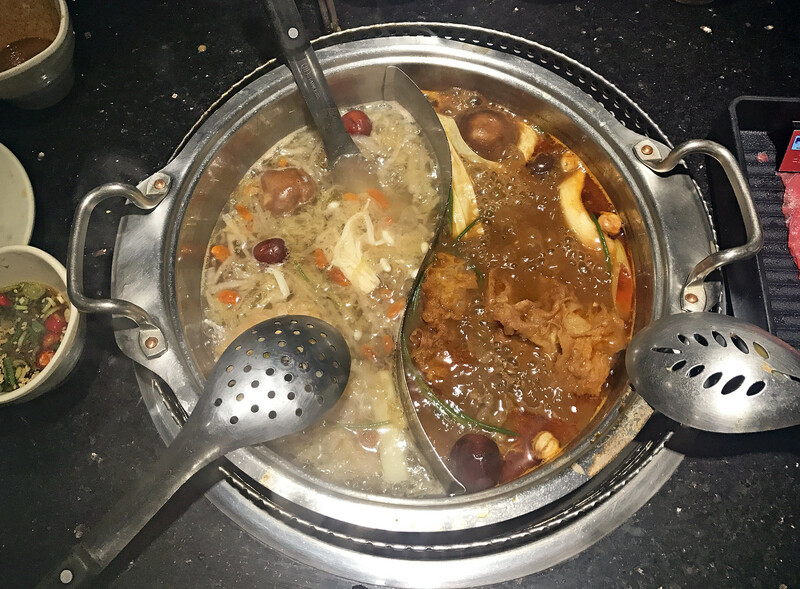 We capped off our evening with a warming meal of spicy Mongolian hot pot. 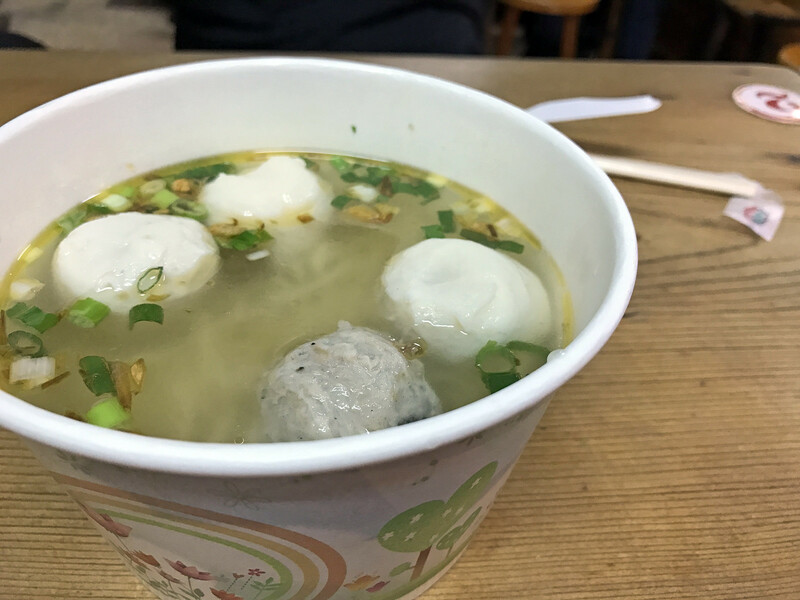 From sushi to hot pot and everything in between, Taipei has it all. 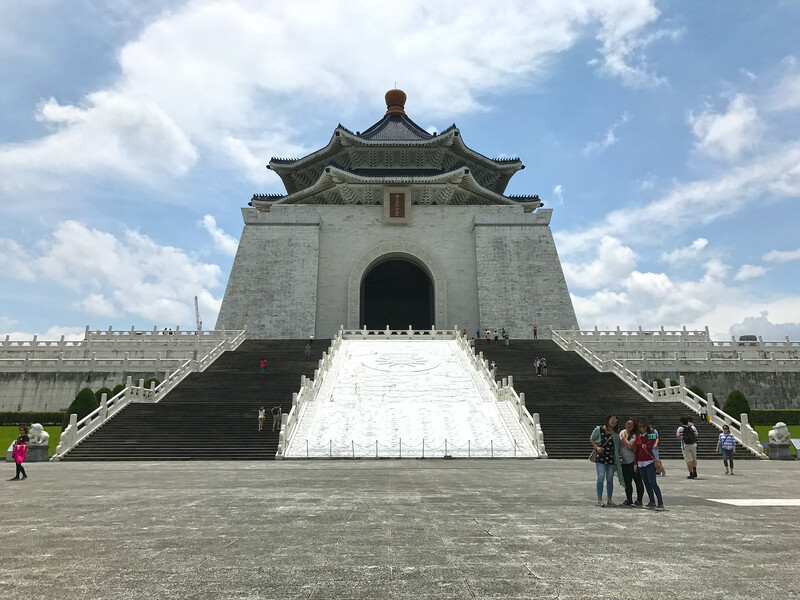 After our day trip to Jiufen and Shifen, we stayed in central Taipei to visit the Chiang Kai-shek Memorial Hall. The square includes the National Concert Hall and the National Theater, with the Memorial Hall as the focal point. 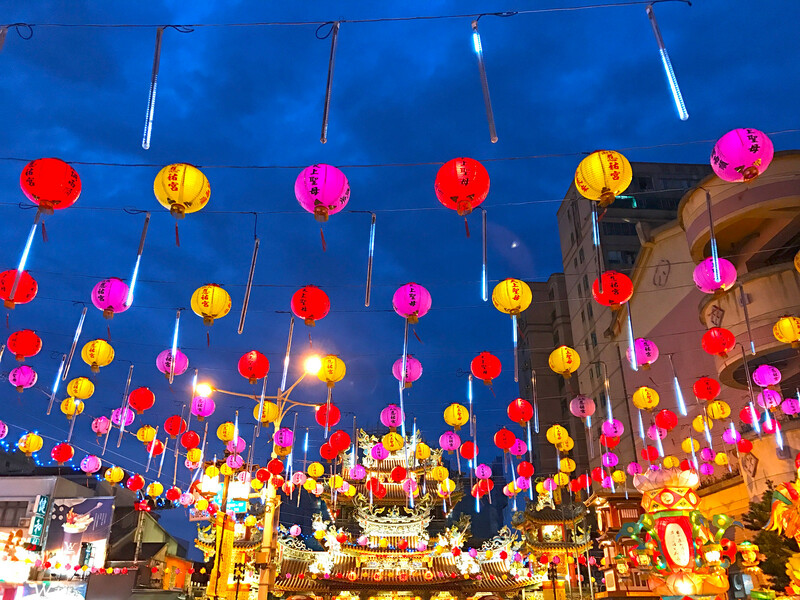 Its roof is blue and octagonal, a shape that represents the number eight, traditionally associated in East Asia with good fortune. We were hungry after all that exploring, so we set out to find lunch. 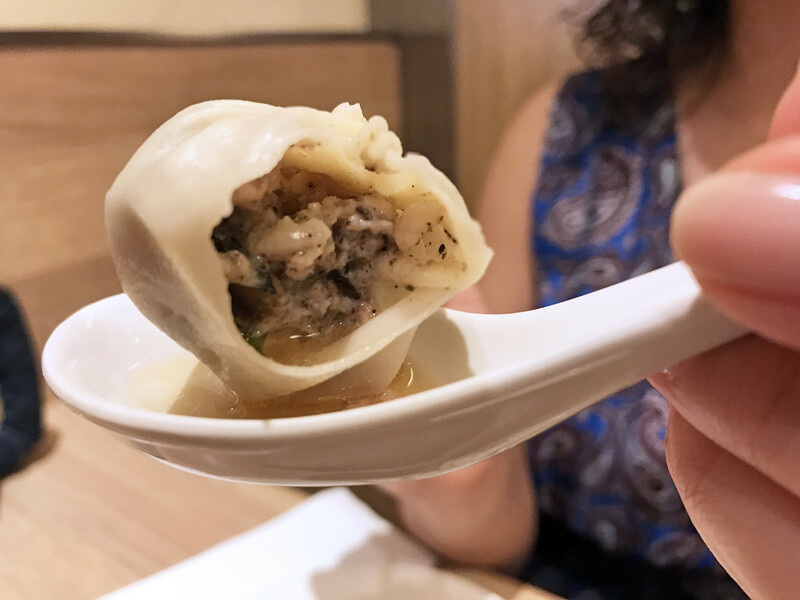 Here’s the part where I ask you to not judge me: we went back to Din Tai Fung. I know! So many incredible restaurants in Taipei and yet we went back for an encore. And what an encore it was. 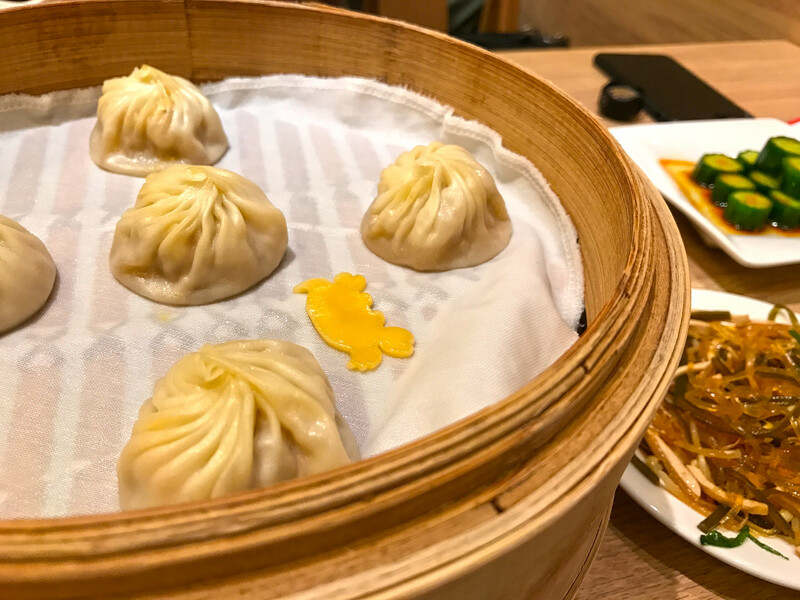 Of course we got the truffle xiaolongbao again. 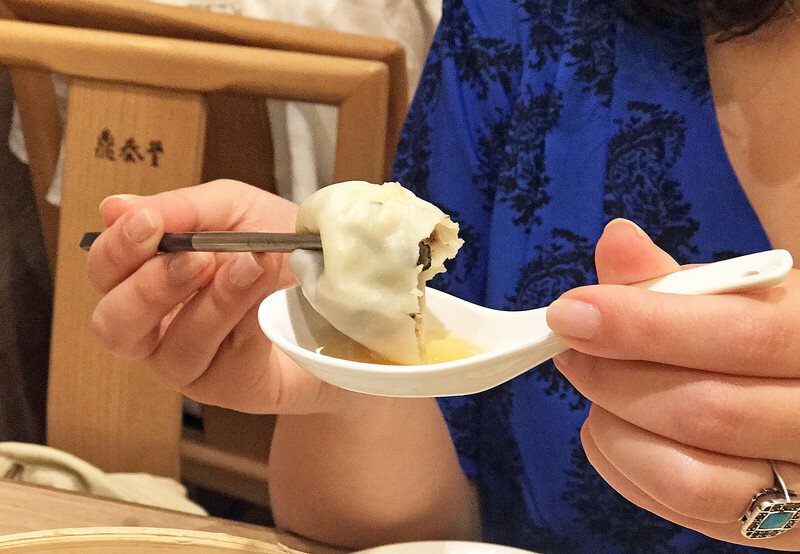 The mildly flavored steamed fish dumplings were a perfect contrast. 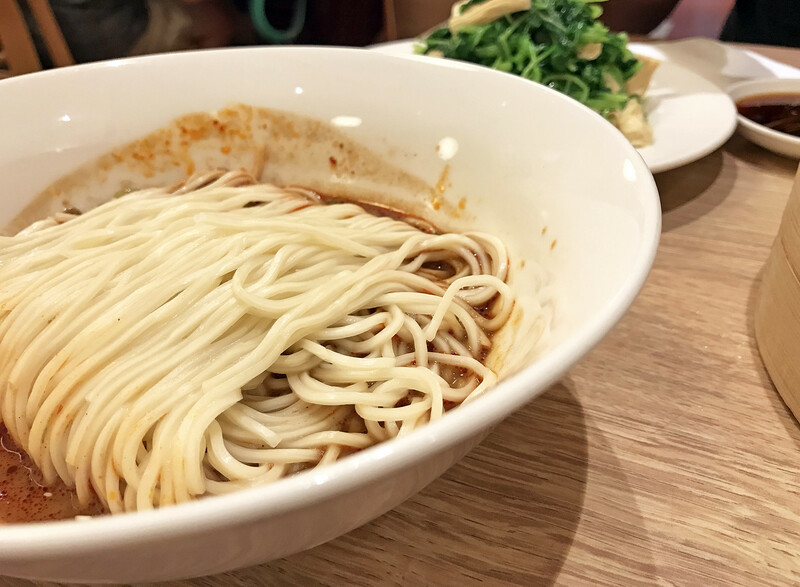 The noodles with spicy sesame and peanut sauce were hard to stop slurping. That noodle texture! 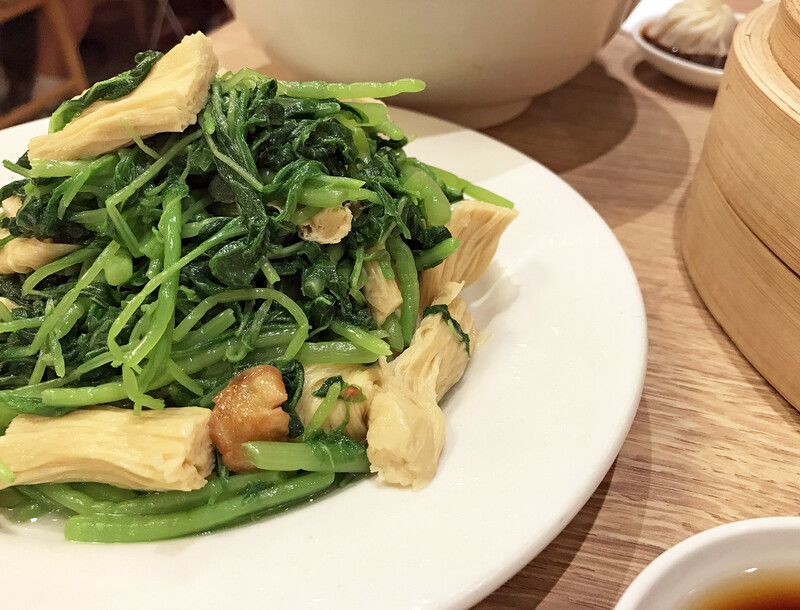 But the surprise here was the stir-fried amaranth greens with yuba. I’ve never had amaranth greens before and loved their mellow flavor and hearty texture. Ever since I tried this dish I’ve been looking for amaranth greens to cook with in California. Afterwards, we spent a couple of hours browsing through the endless streets of Wufenpu, Taipei’s gigantic wholesale shopping district. We walked for miles and I don’t think we even covered half of the little shops, although dodged more than a few (friendly) motorbikes along the crowded alleyways stacked with the latest fashions. 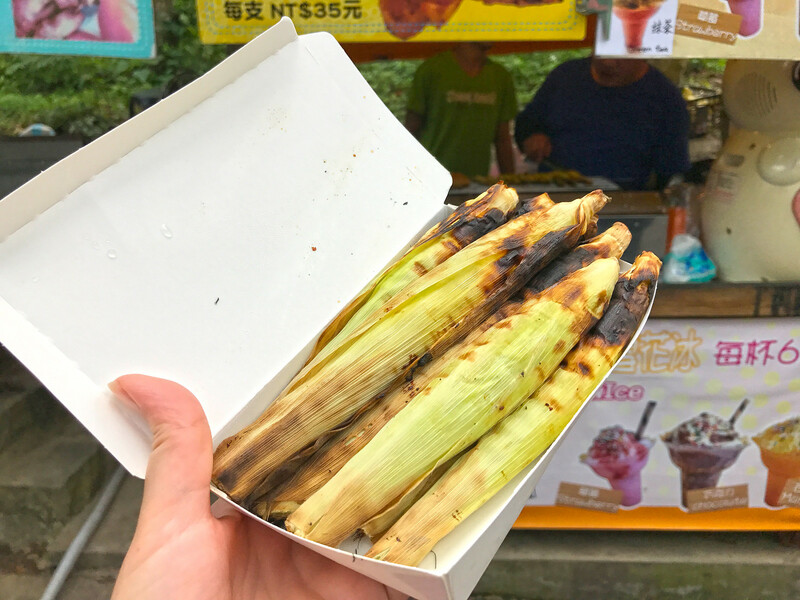 We eventually made our way to Raohe Street Night Market, sipping on sugar cane juice and sampling grilled meats from vendors as we went. The real standout though? This humble looking black pepper bun. 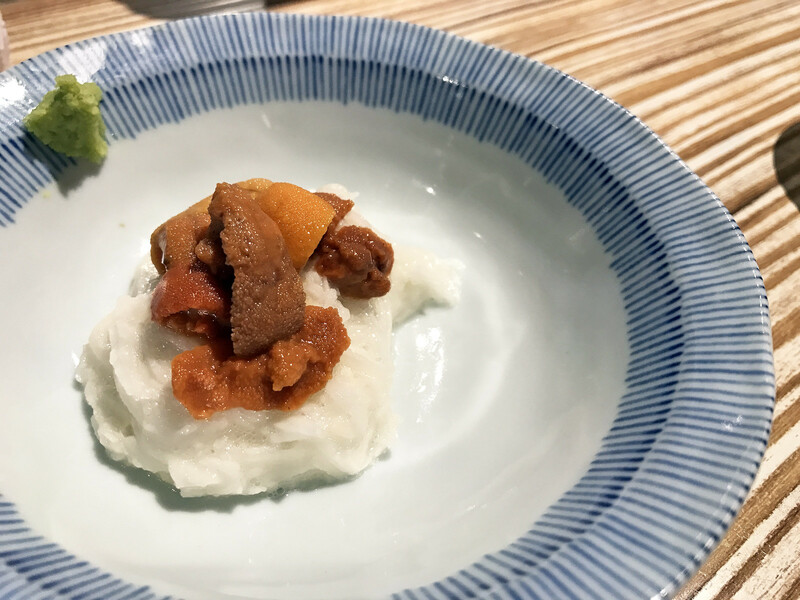 Filled with the juiciest, onioniest meat, the bread is crispy yet chewy, and the pepper flavor lingers pleasantly. 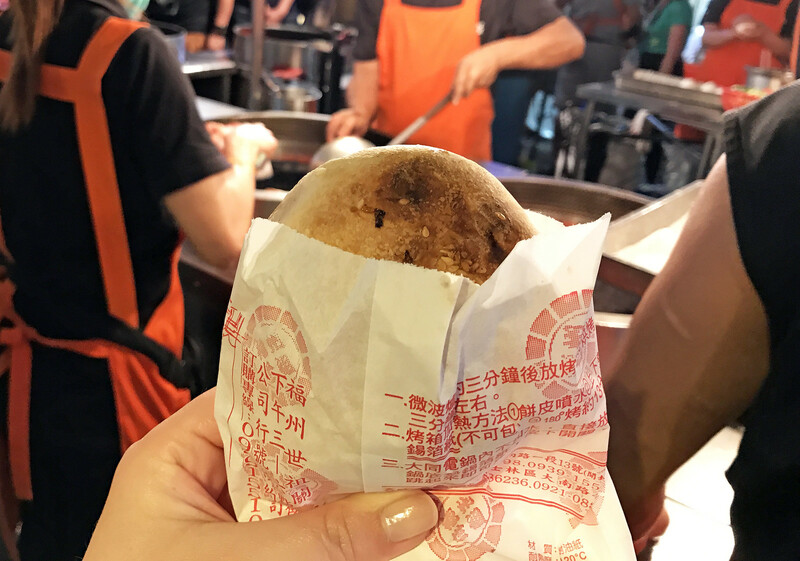 Located right at the beginning of the market, these buns alone are worth the trip to the market. 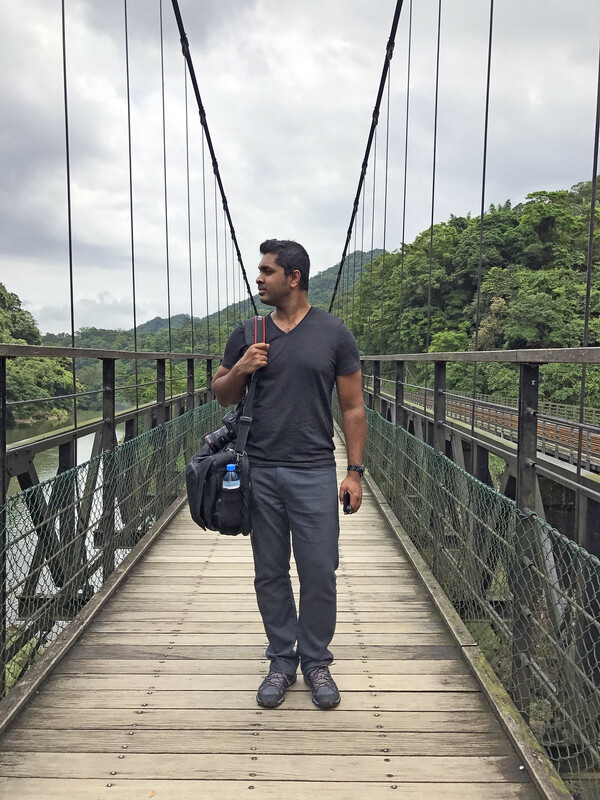 The thing about Taiwan is that for such a small country, there is really so much to see. 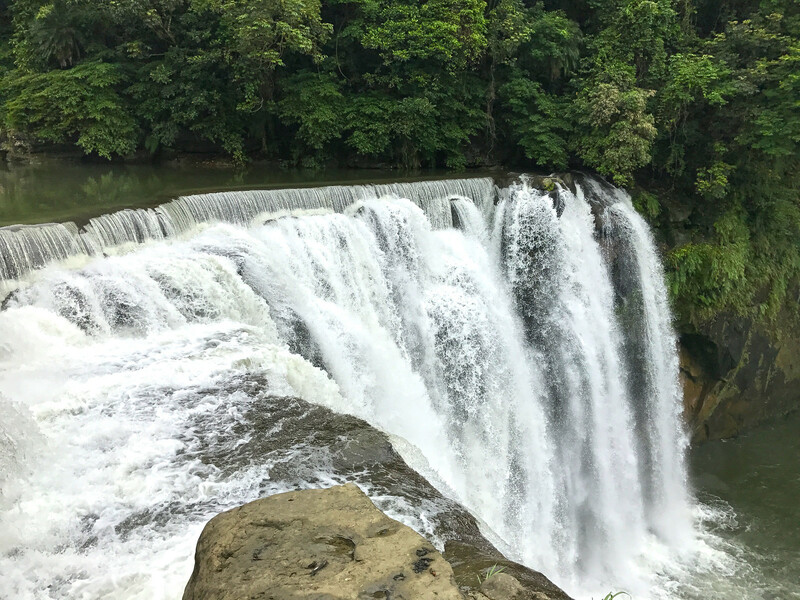 With only one week, it was hard to decide what day trips to take out of Taipei. 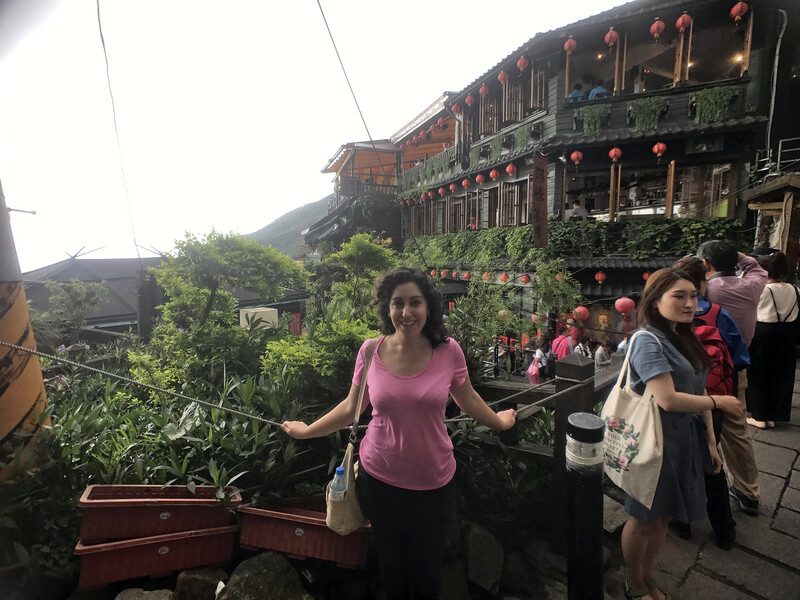 My favorite was our trip to Shifen and Jiufen, famous for the lantern ceremony and for inspiring Miyazaki’s Spirited Away, respectively. To say it’s otherwordly does not do it justice. 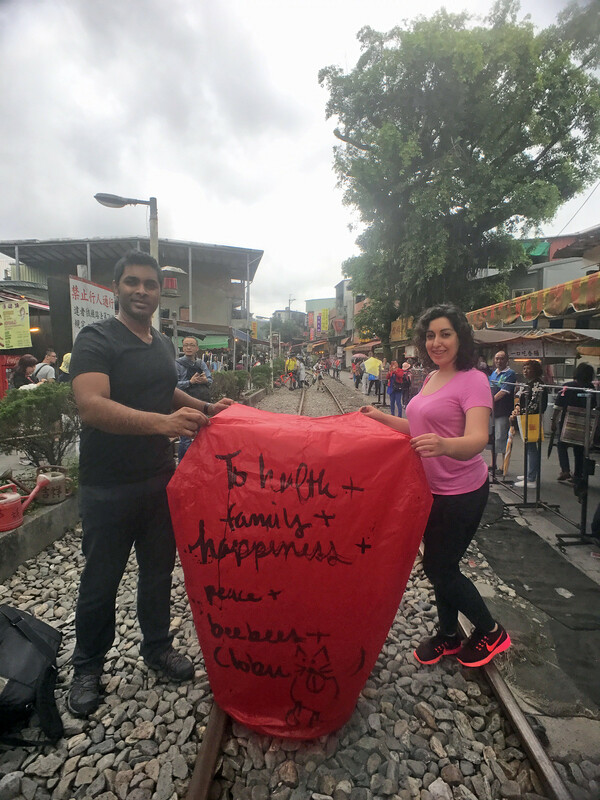 We took a train about an hour outside of Taipei to Shifen, our first stop. 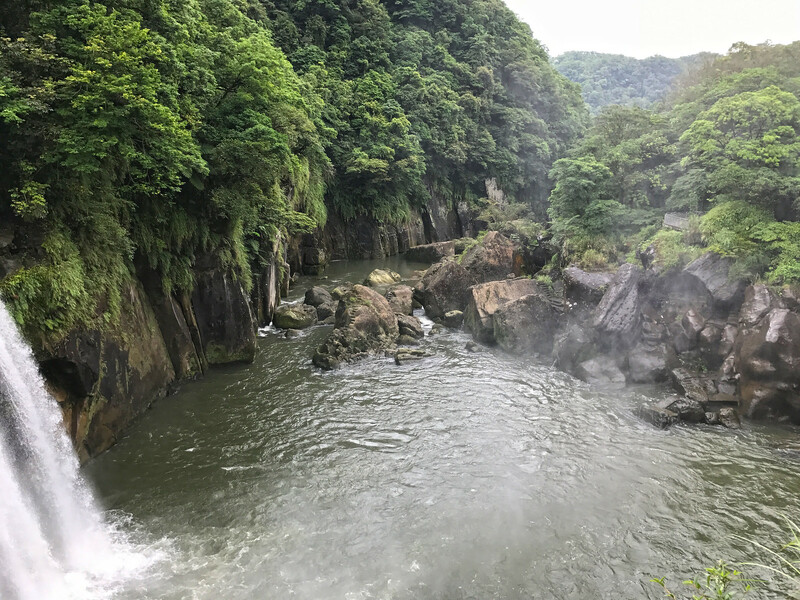 Historically a mining town, today Shifen is famous for its lantern ceremonies and for its picturesque waterfall and trails. But first, we ate. 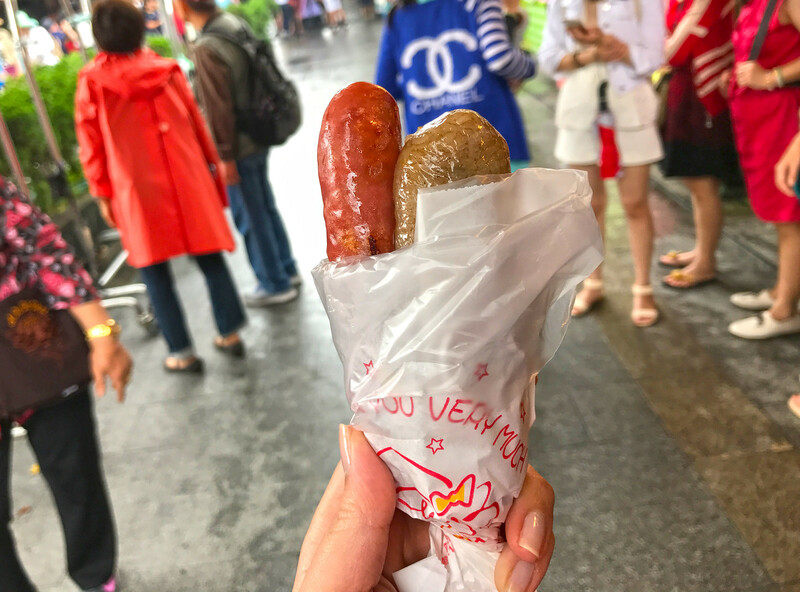 The small sausage in large sausage (which is a meat sausage wrapped inside a sticky rice “sausage”) was a dud, but the fried squid? These addictive, salty morsels kept us going all morning. Who says you can’t have deep-fried seafood doused in tasty powder of dubious origins for breakfast? 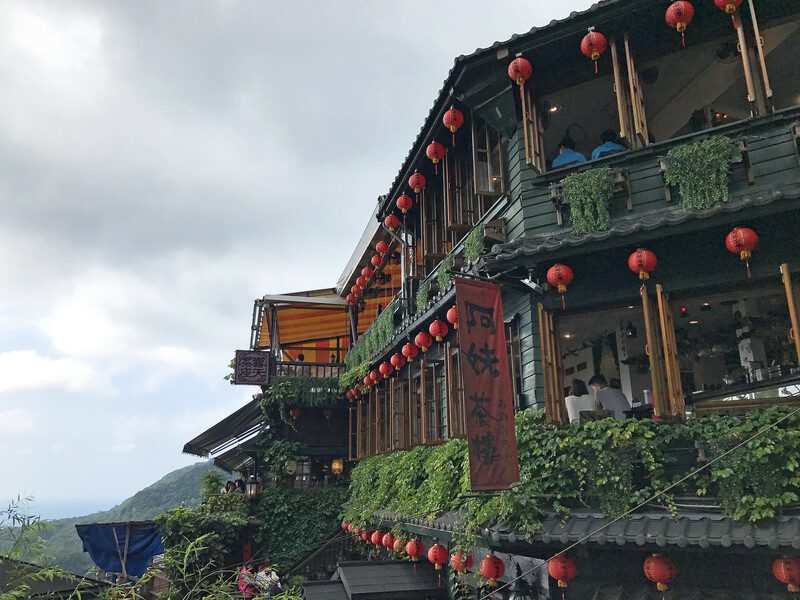 We eventually made our way back to town and caught a taxi to take us to Jiufen. Our driver was quite possibly the kindest driver in Taiwan (remember what I said about Taiwan being the friendliest country on earth?). He stopped in a small town along the way to pick us up a piping hot snack for the road and refused payment for it. 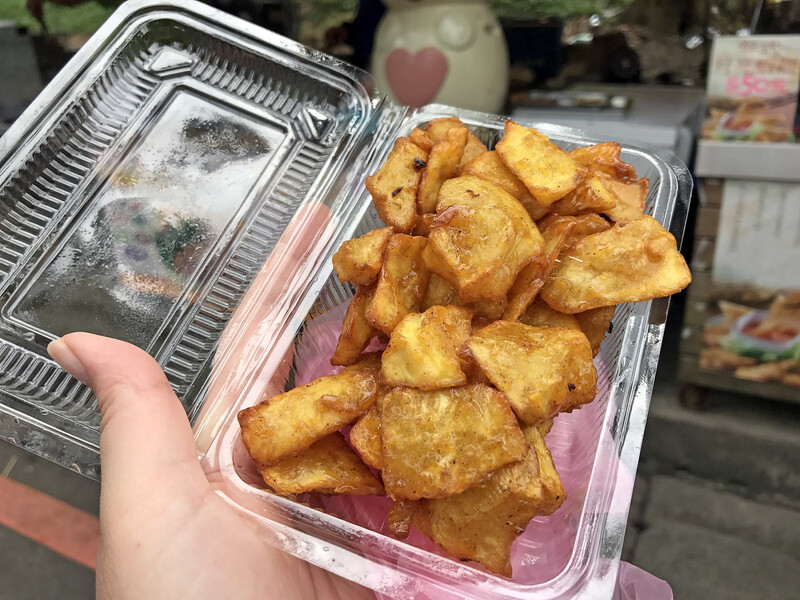 He shared with us that this savory snack is a specialty of his hometown, and I wish I knew what they were called. 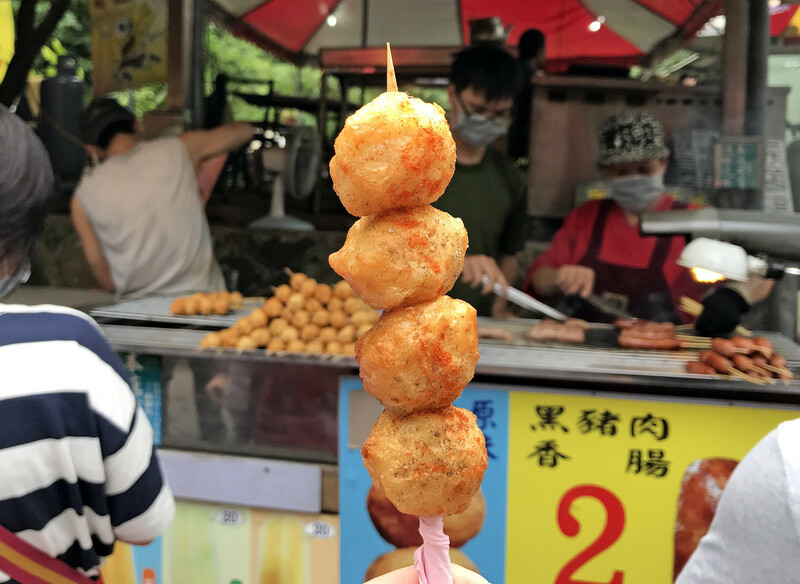 It was sort of like a fried egg-and-cabbage batter on a stick and really satisfying. 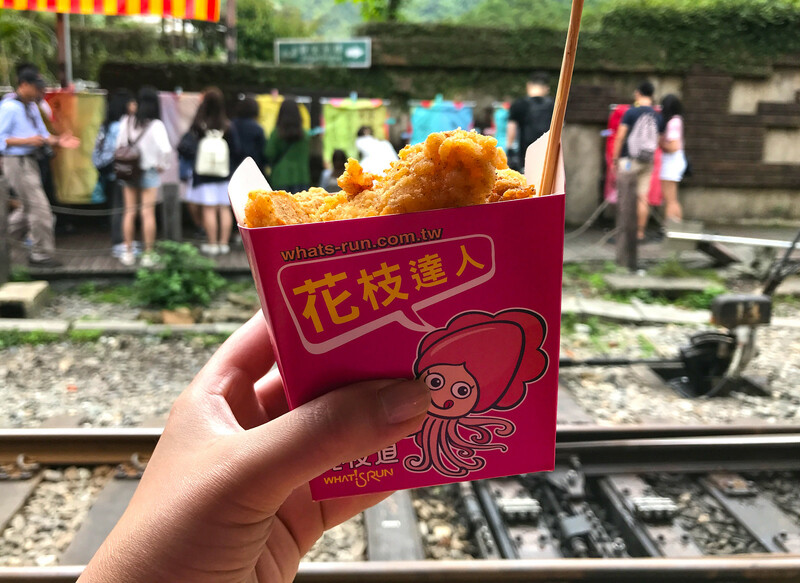 Jiufen is a sight to behold. 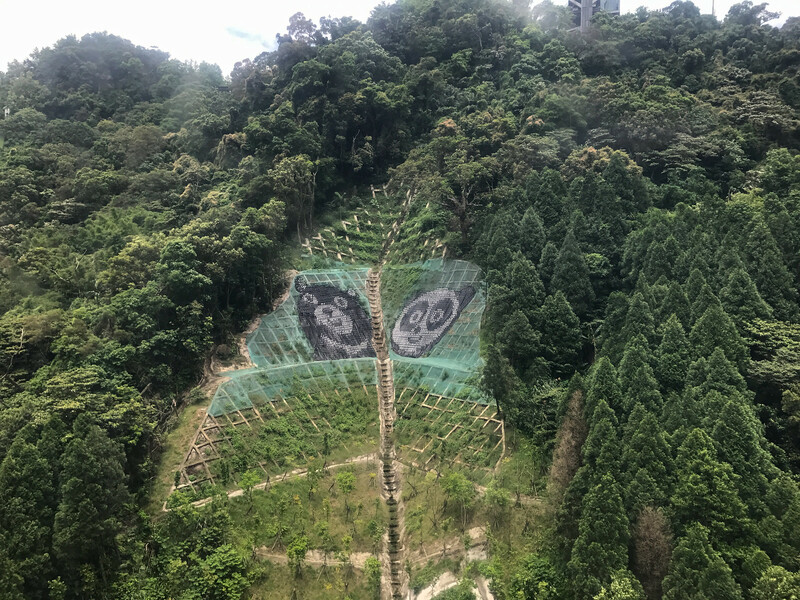 Nestled in the mountains, it’s easy to see how Miyazaki was inspired by this place. 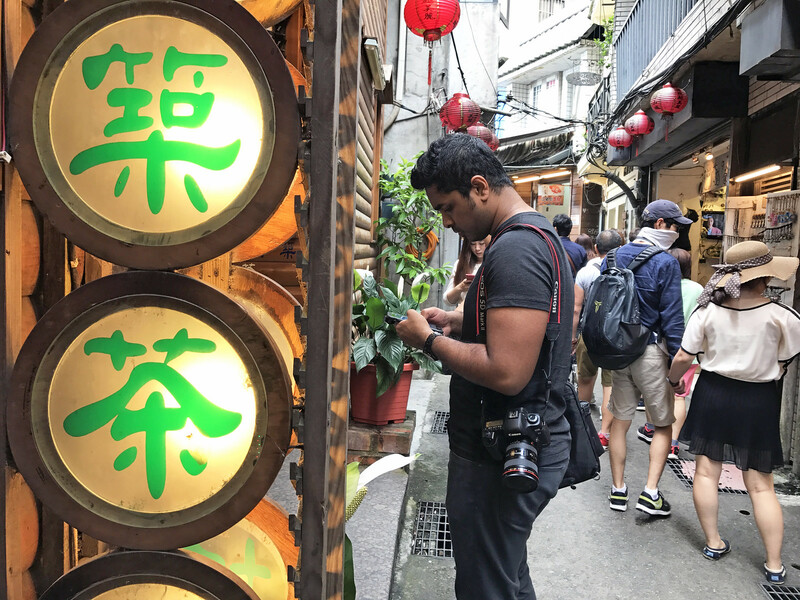 Even hordes of tourists couldn’t dampen the beauty and serenity of Jiufen’s alleyways and cobblestone streets. 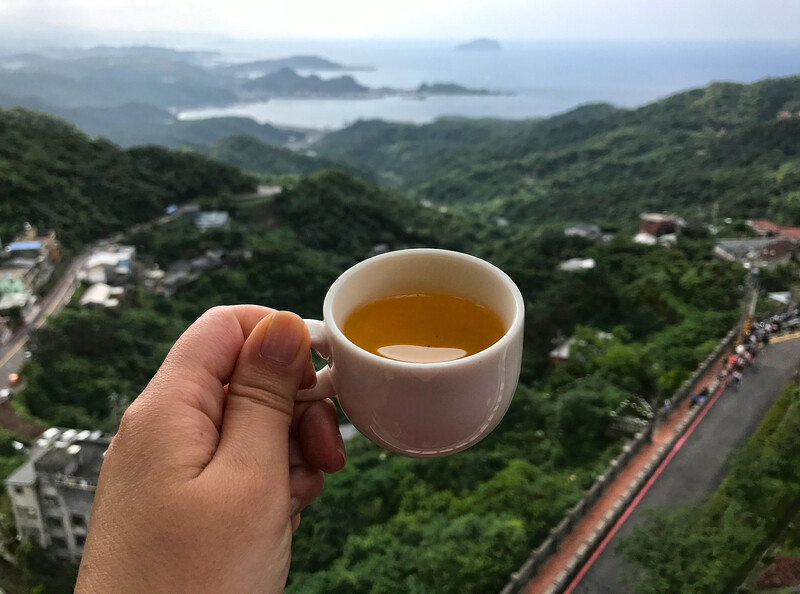 We snacked on spicy grilled mushrooms and fishball noodle soup as we made our way through town, stopping at the picturesque A Mei Tea House but stopping at a smaller, less crowded teahouse to enjoy a cup of oolong. 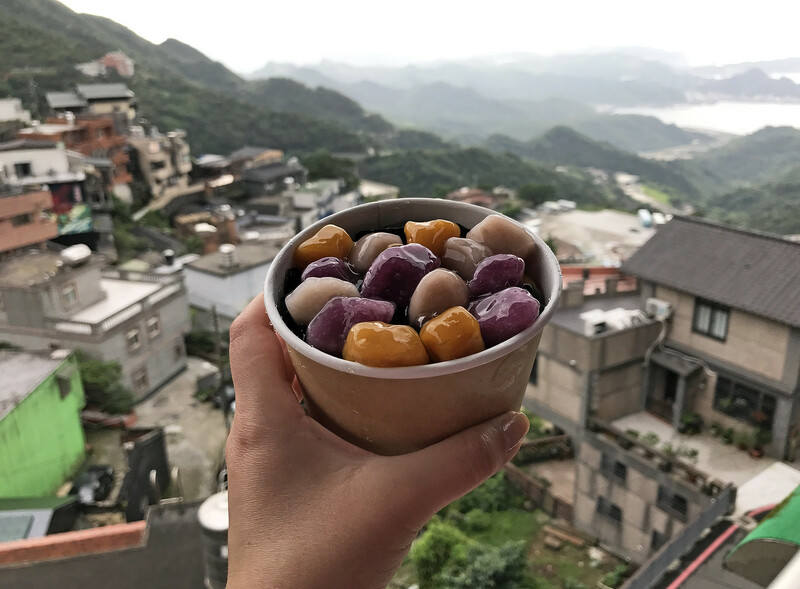 But the real highlight for me was another Jiufen specialty: sweet taro balls. Served over shaved ice, this is a cacophony of QQ. 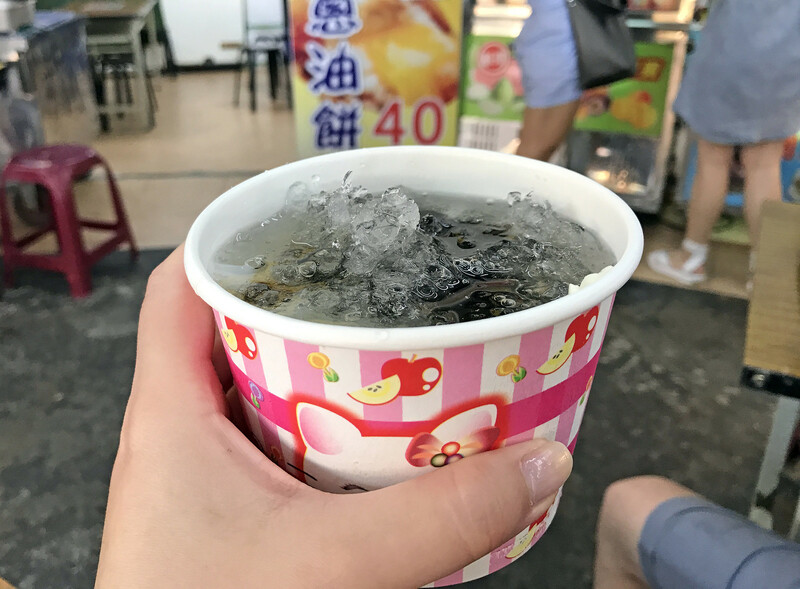 For the initiated, QQ is a phrase in Taiwan that means “toothsome,” or “chewy.” Think boba in milk tea. 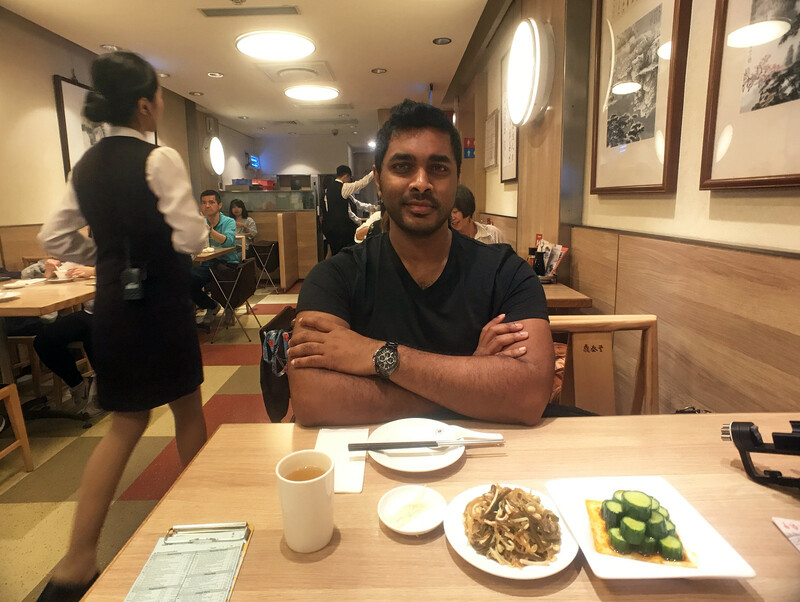 As afternoon turned to evening, Nishan and I headed back to Taipei for dinner at Shin Yeh. 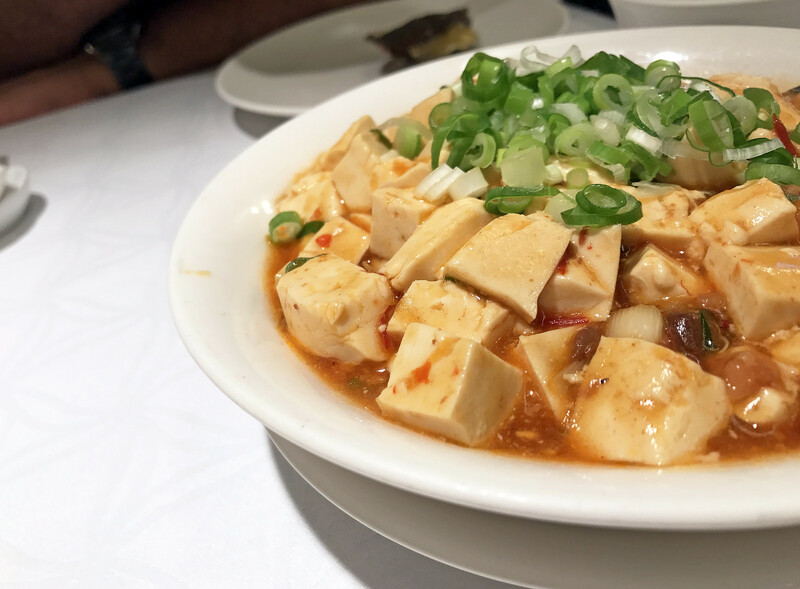 Shin Yeh serves banquet-style Taiwanese cuisine and there are a few in the city. 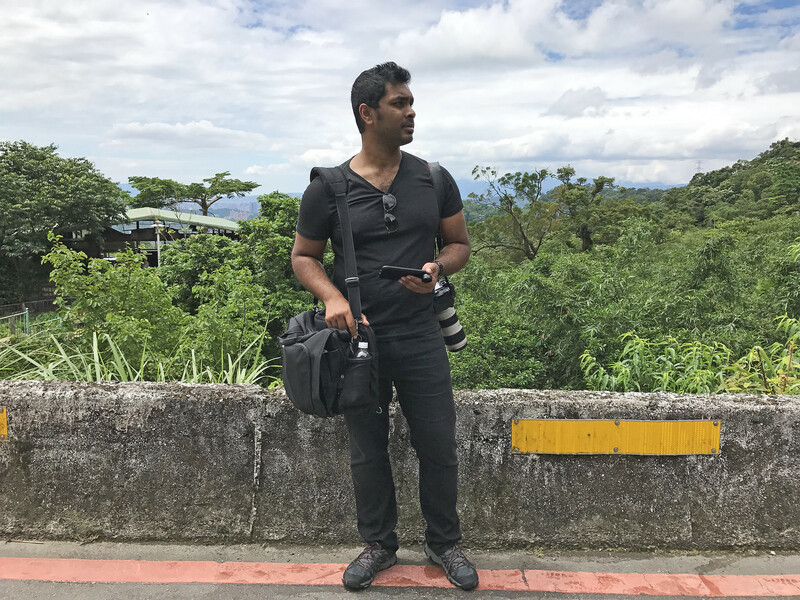 We headed to the Zhongshan District location. I was really excited for this meal but it fell short. I take partial responsibility as I may not have ordered the right dishes. 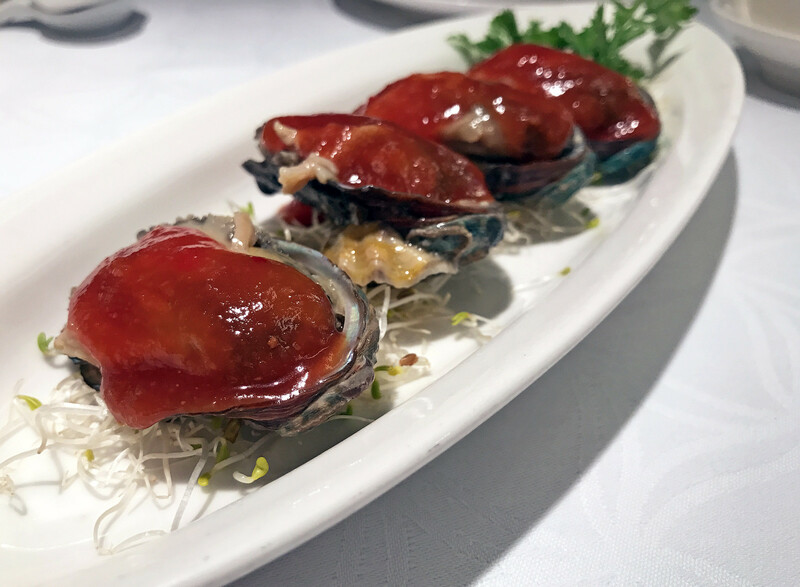 The abalone wasn’t tender, the crab roe was, well, not very crabby, and the ma po tofu was ketchupy. 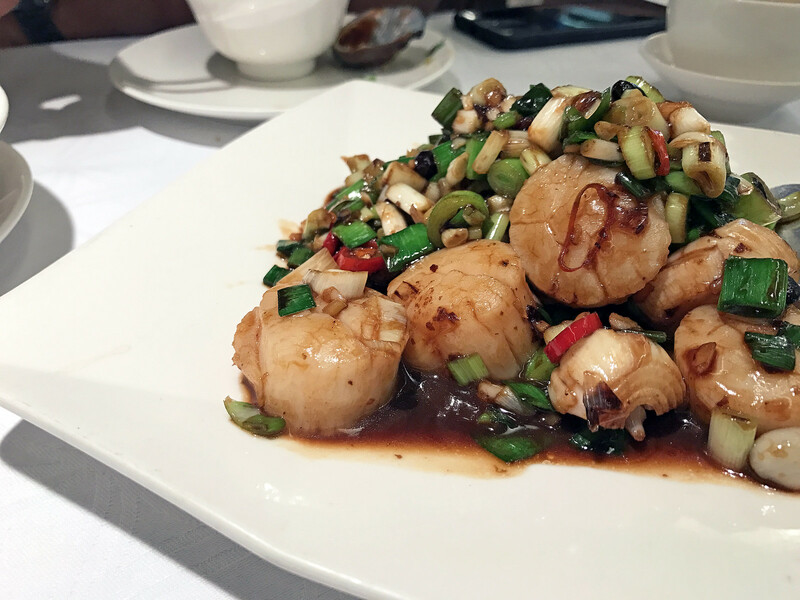 I enjoyed the scallops with black bean sauce, though. Still, my favorite restaurant in Taiwan continues to rhyme with Min Hai Tung. I would be lying if I said that I didn’t go to Taiwan so I could eat at the original Din Tai Fung. 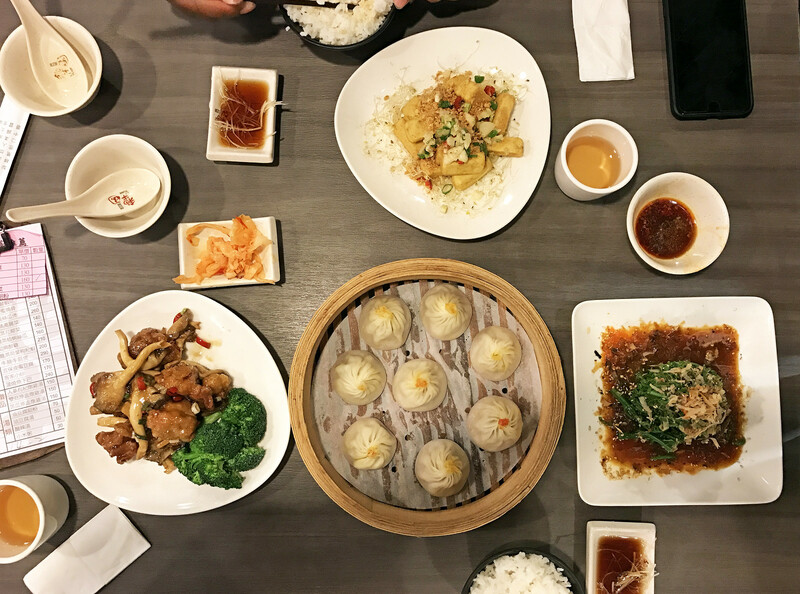 You see, I’ve eaten at the famed dim sum restaurant’s outposts in the San Gabriel Valley of Southern California a handful of times, but I wanted to go to the source. 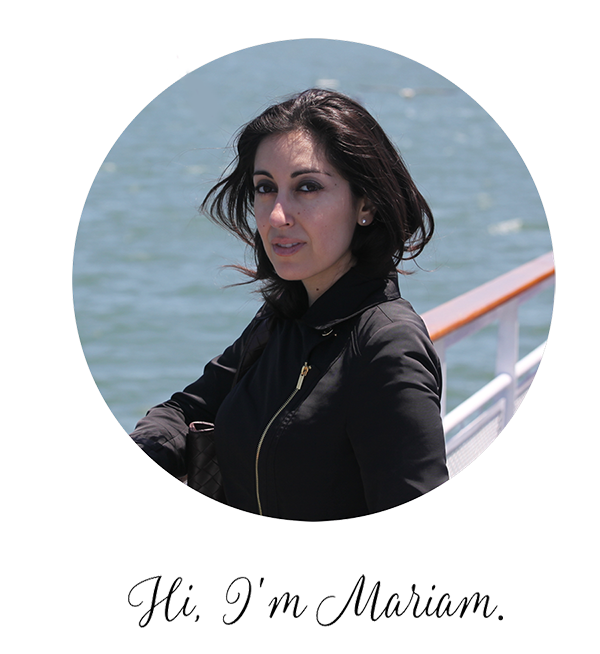 I knew it was a touristy thing to do, but you know what? It was totally worth it. 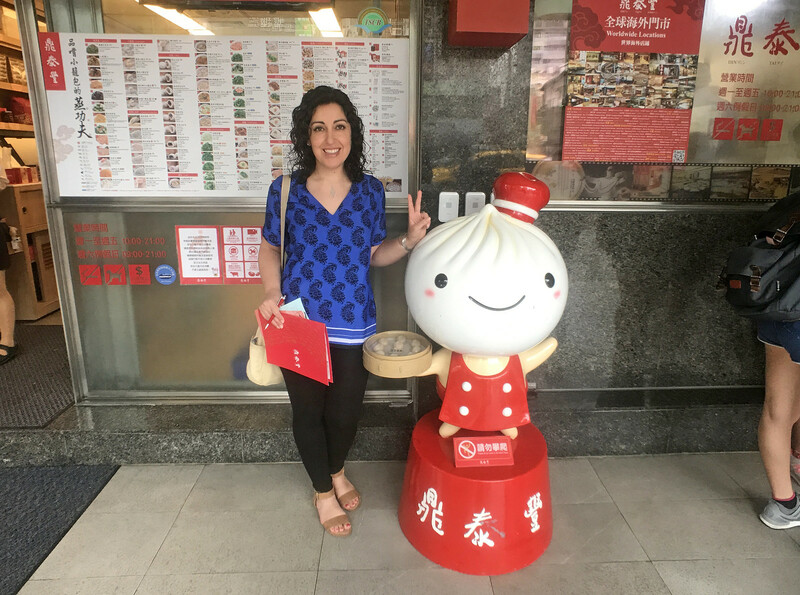 My meal at the original Din Tai Fung near Dongmen Station (not to be confused with the newer Din Tai Fung in Taipei 101) was one of the best meals of my life. 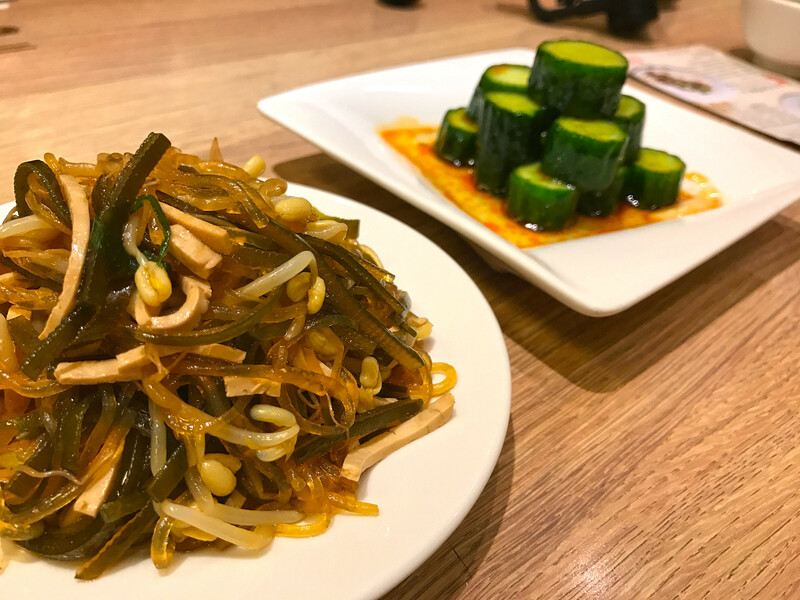 The Din Tai Fung house special and spicy cucumber salad were both as good as I remember the San Gabriel Valley ones being, if not better. The stir-fried cabbage was a revelation. How can something so humble and so simple taste so savory? 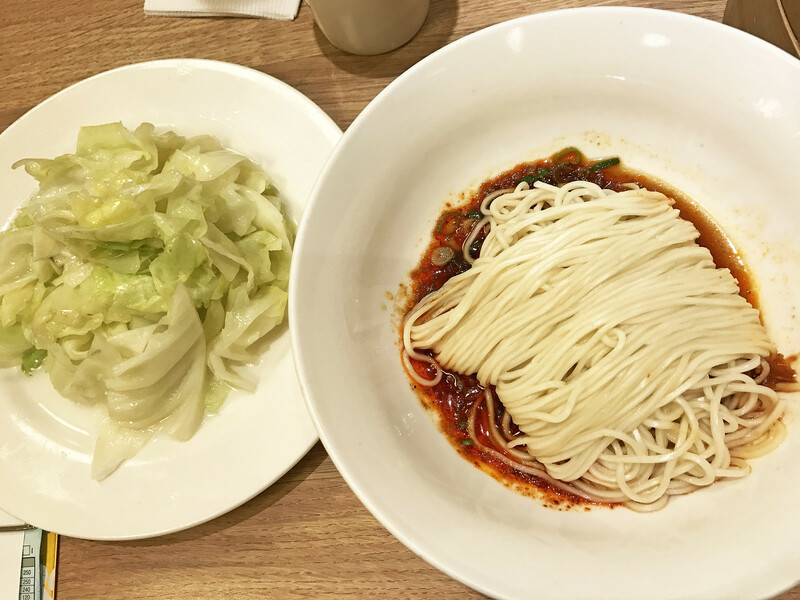 And the noodles were doused in an addictively garlicy and peppery sauce. They were perfect. But the highlight of the meal were the dumplings. So. Many. 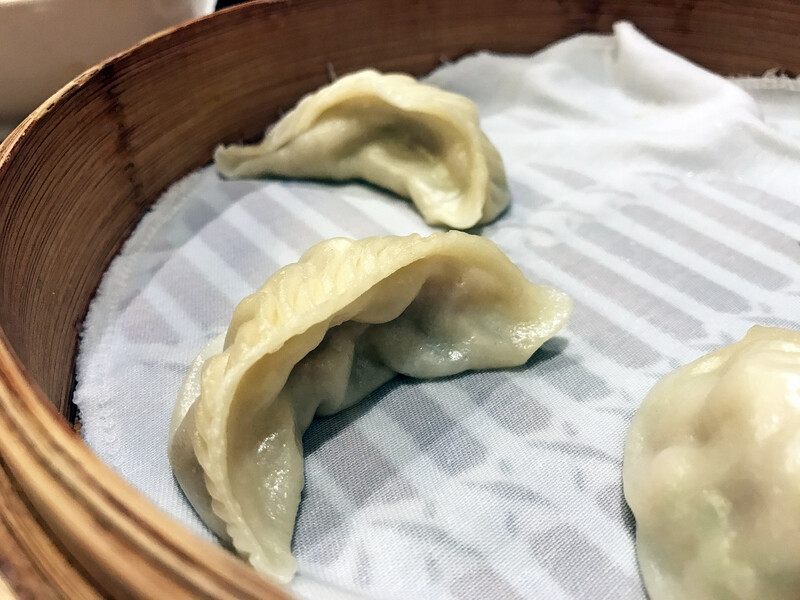 Dumplings. 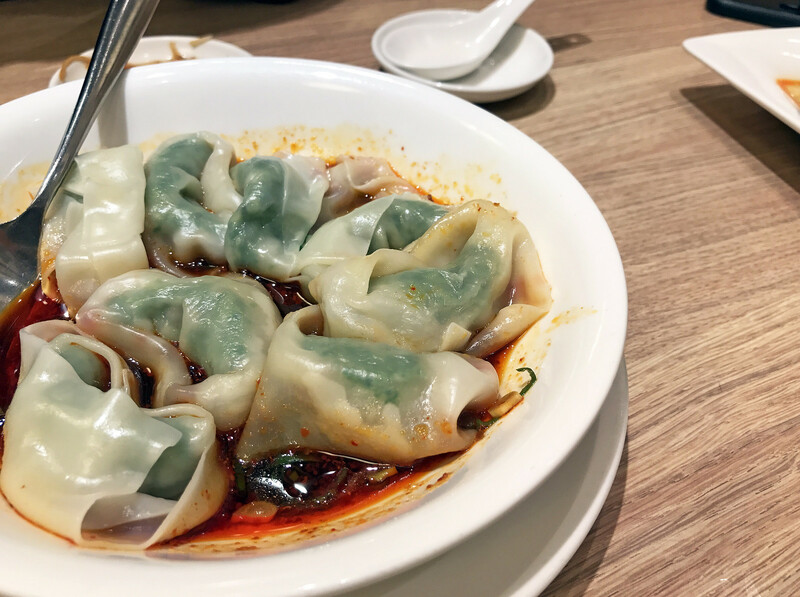 The house special spicy vegetable and meat wontons were paper-thin, succulent, and juicy. And the sauce? Oh my. 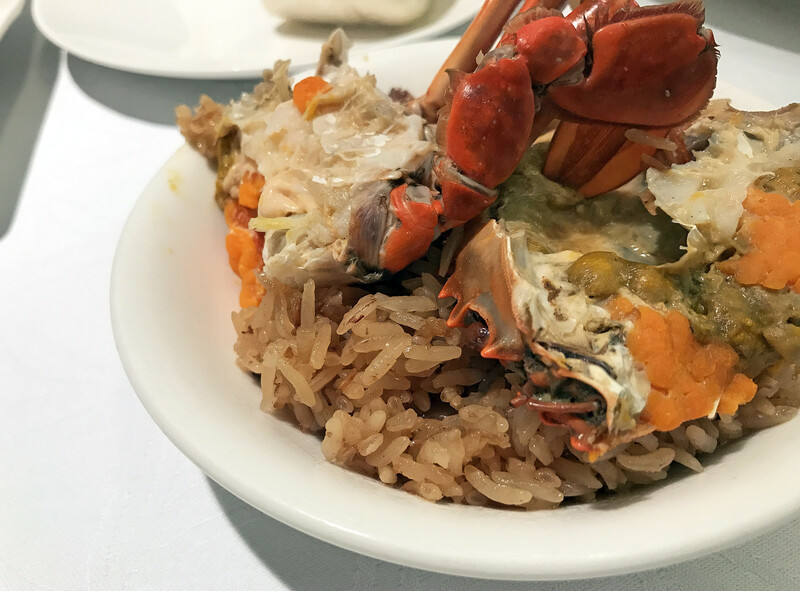 The crab roe and meat xiaolongbaos were perfectly briny and tasted faintly of the sea. I loved them. I could twenty of these. And despite everything tasting so good, the real highlight of the meal were the truffle and meat xiaolongbaos. Imagine generous shavings of truffle permeating every brothy, meaty bite. These needed no dipping sauce on the side. They. Were. Perfect. It’s a shame you can’t find these stateside. 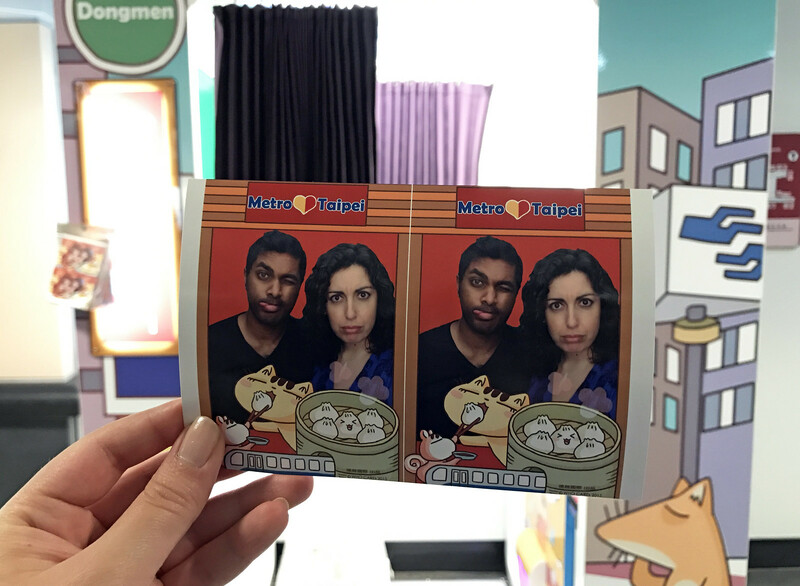 And this, my friends, are the faces of two more-than-satisfied customers. 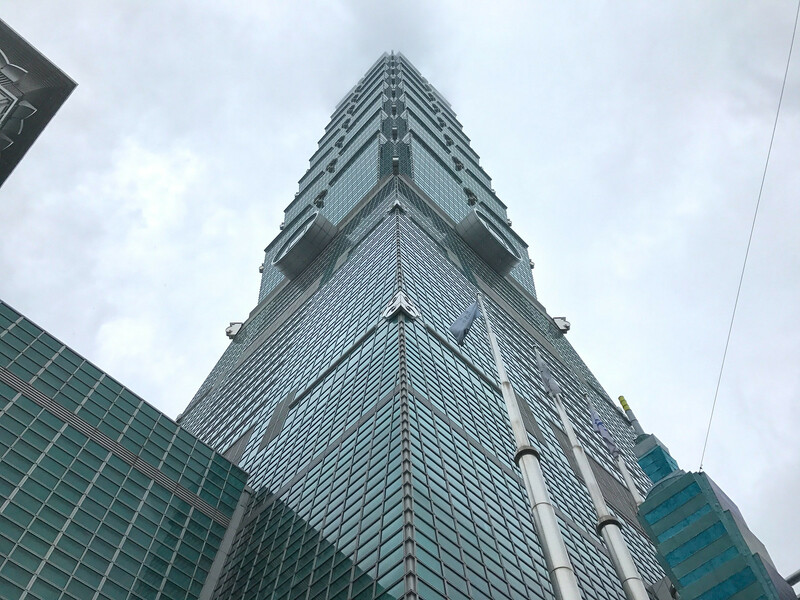 After a meal like that, we blissfully made our way over to the Xinyi District to check out the observatory at Taipei 101. 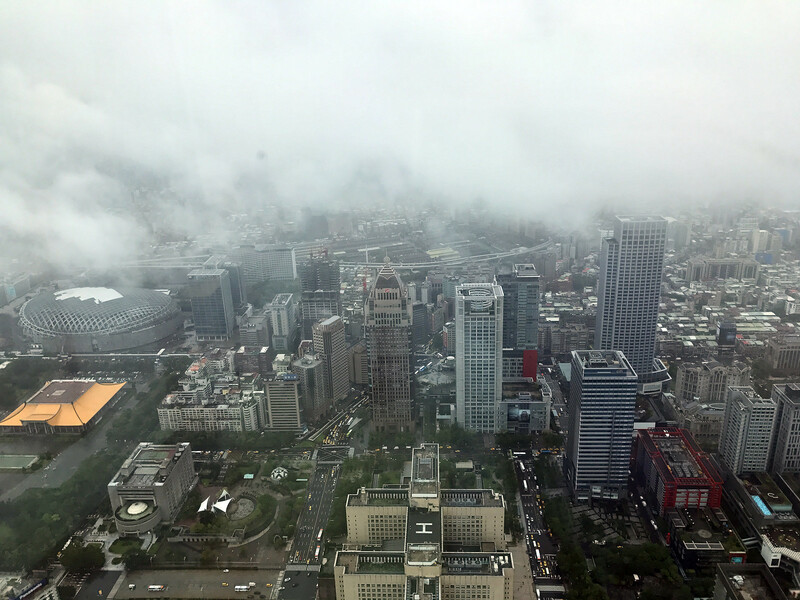 At 382 meters above ground, the observatory is in the tallest green building in the world. 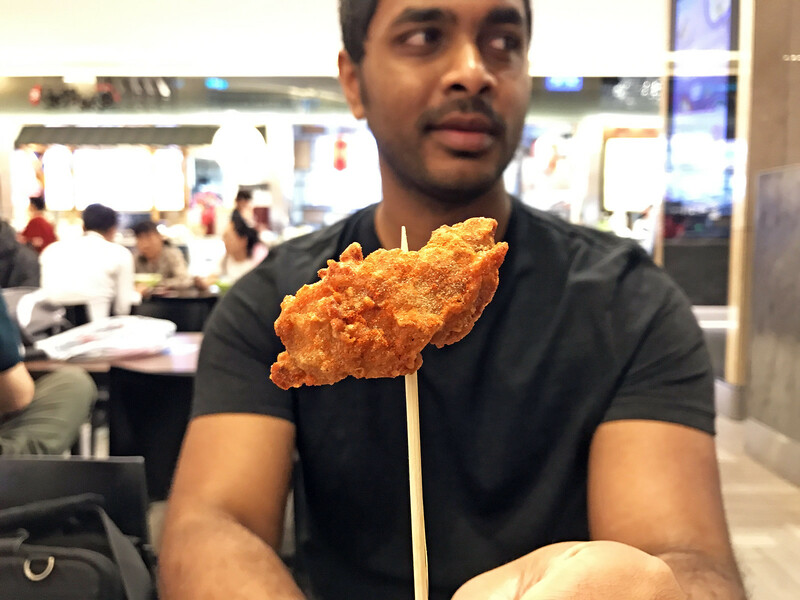 We stopped for a quick snack of fried chicken before leaving Taipei 101 and you know what? 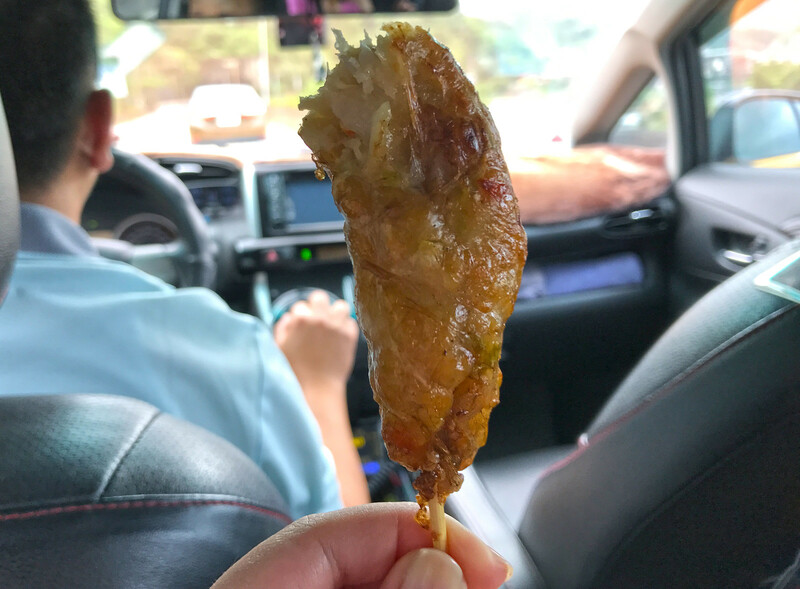 Taiwan does not play when it comes to fried chicken. Even at the mall food court. By now it was afternoon and it was pouring rain outside (Taipei is rainy, y’all) so we hopped on a bus (Taipei’s public transportation is excellent) and headed to Wistaria Tea House. 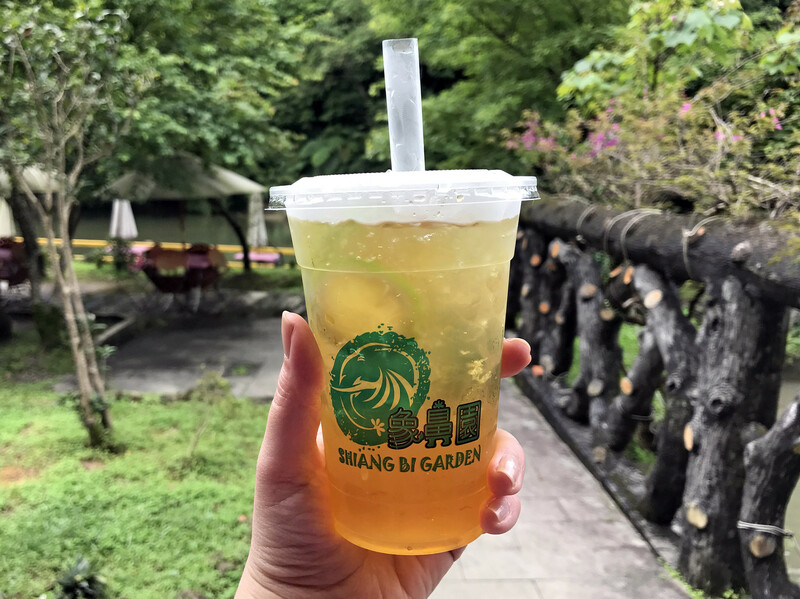 Taiwan is steeped in a complex and well-established tea culture. Nowhere is this more evident than at Wistaria Tea House, a historical teahouse built in the 1920s in Da’an District. 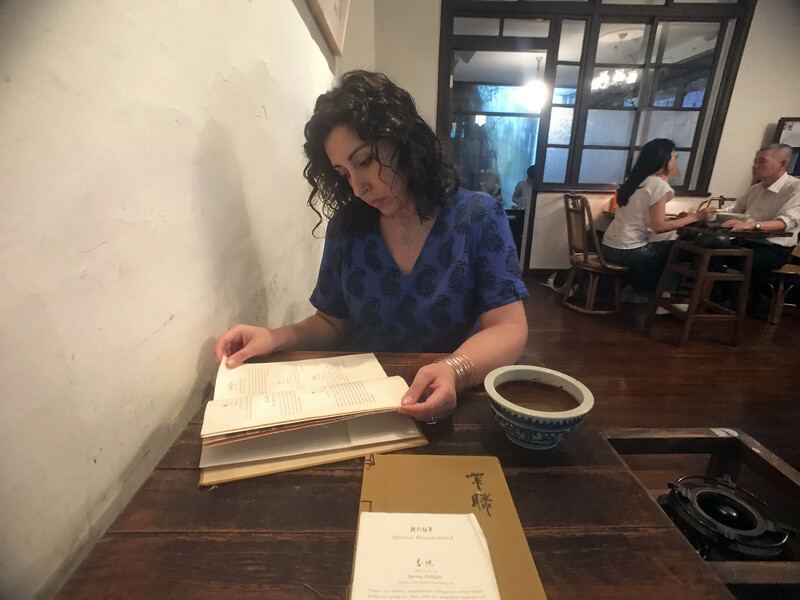 The teahouse was a meeting place for political dissidents during the 1980s and today, it’s a favored hangout for literati, artists, and academics. 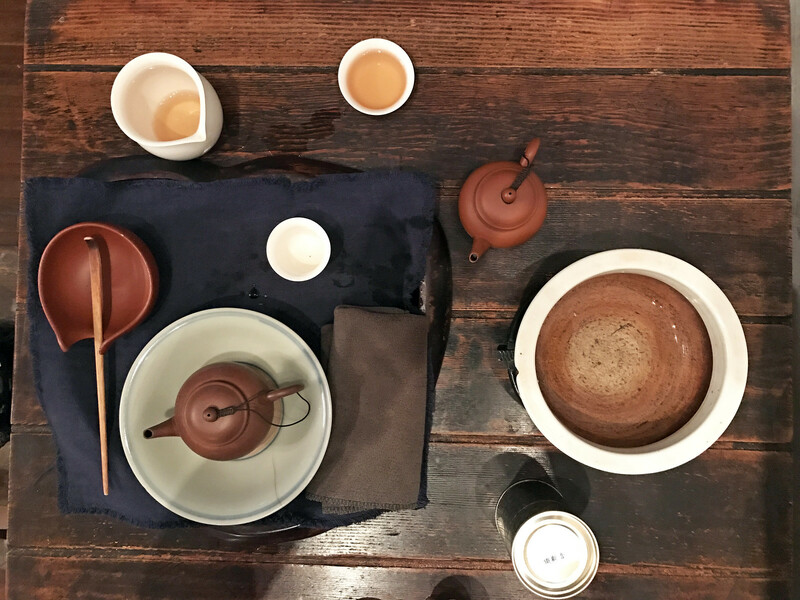 We sampled an array of traditionally-prepared teas, with a focus on Taiwan’s oolong varietals. We spent the evening exploring Eslite, a well-loved and gigantic bookstore. There are a handful of these in the city and we checked out the Dunnan Store location, which is open 24 hours a day. That’s my kind of bookstore. 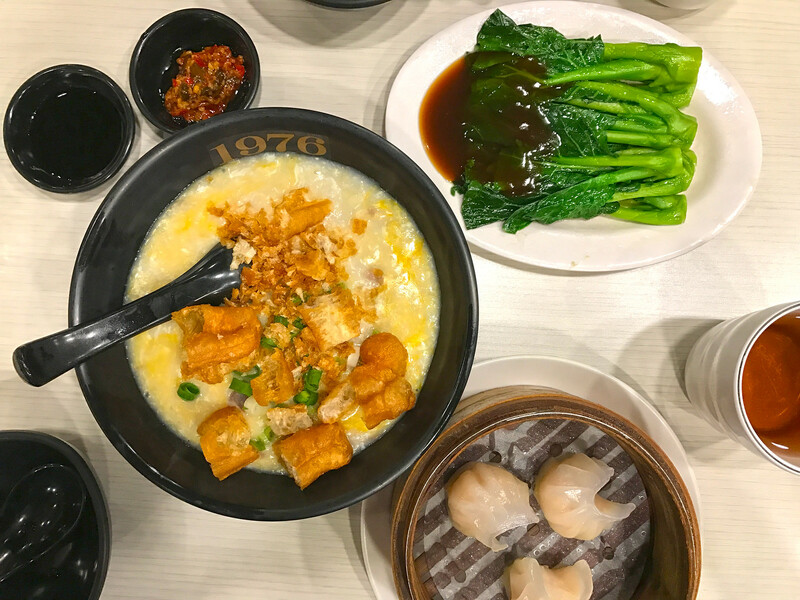 For dinner, enjoyed a Hong Kong-style meal of congee with beef and egg, gai lan, and har gow at the nearby 1976 Restaurant.